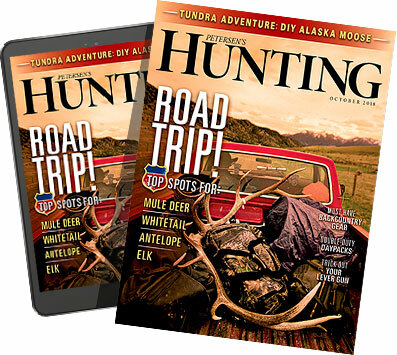 Flip through the pages of an outdoor magazine, and it usually doesn’t take long before a story is seen concerning the wild outdoor adventure available in Canada’s province of Saskatchewan. One of the North American continent’s agricultural epicenters, the province is also filled with vast numbers of lakes and dense timber the further north one goes into Saskatchewan’s Boreal Forest. Put together, the rugged landscape is one that offers world-class hunting and fishing adventure — especially when one is pursuing some of the biggest whitetail bucks on the continent, massive springtime black bears or the vast numbers of waterfowl that migrate through the province each fall. Put simply, Saskatchewan is a hunter’s heaven. Back on Nov. 23, 1993, Saskatchewan farmer Milo Hanson showed the deer hunting community how world class the big bucks could be in the province when he downed a 213 5/8-inch typical buck near his home in Biggar. Today, a quarter of a century later, the buck remains the Boone and Crockett Club world record typical. 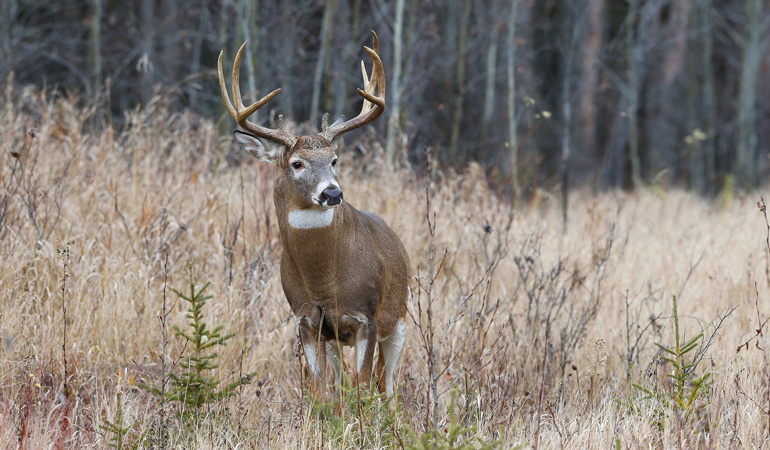 Why is Saskatchewan so good for deer? 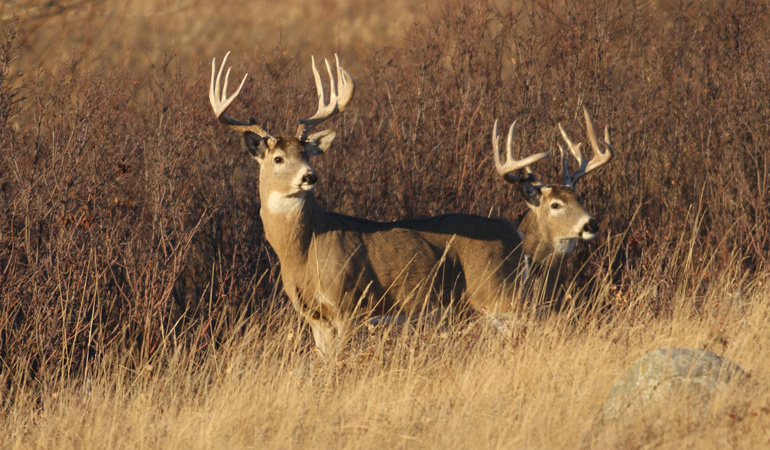 Hunting the big bucks of Saskatchewan is an unforgettable experience according to Gregg Ritz, a longtime Outdoor Sportsman Group television personality who hosts Hunt Masters on Outdoor Channel. Hunting with a muzzleloader during an unseasonable cold snap in the late fall, Ritz sat in a treestand from daylight to dark. Seeing multiple deer each sit, he finally decided to cash his unused tag in on the 10-point, 140-class whitetail mentioned above. While he’s still seeking his own version of the Milo Hanson buck, Ritz eagerly keeps coming back to Saskatchewan for more. 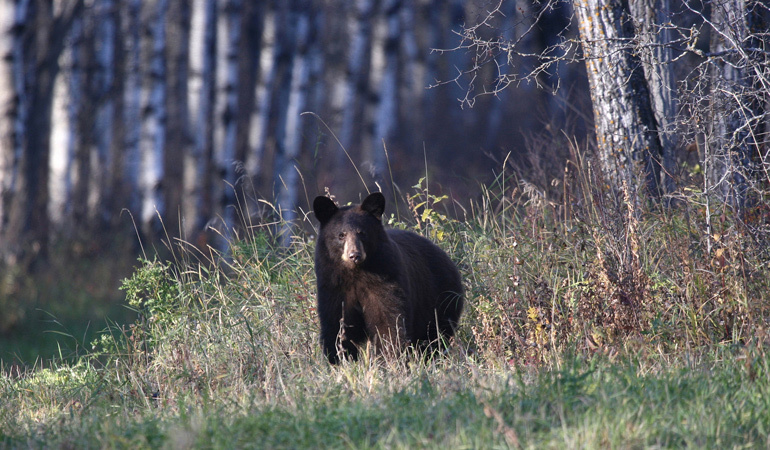 If the wilds of Saskatchewan are noted for its big bucks, the same goes for the black bears that roam the province, too. Pat Reeve, who along with his wife Nicole hosts the award-winning Driven TV program on Outdoor Channel, agrees that when it comes to black bear hunting, Saskatchewan is a tough place to beat. In fact, the Reeve family spent time at Buck Country Outfitters in Saskatchewan during the spring of 2018 with daughter Isabel taking a great bruin with a crossbow. And in previous spring hunts, the couple has taken some truly remarkable sized bears of their own on treks north of the border from their Minnesota home. “We hunt a couple of different provinces in Canada, but we spend most of our bear hunting time in Saskatchewan,” said Pat. Why? In addition to super-sized bruins, hunters visiting Saskatchewan have a chance to take one of several black bear color phases according to Reeve. They also keep going back thanks to the size-factor that Wells referenced above. In fact, Reeve’s daughter Olivia shot a 500-pound bruin a few years ago while hunting in Saskatchewan. With a 21-inch record book sized skull, the huge bear was tagged as Olivia sat on the ground using a crossbow. As the bear came in close for a shot, there was plenty of adrenaline flowing as Olivia steadied her nerves, settled her aim, and let the Driven TV cameras record the amazing footage on a hunt for the black bear of a lifetime. For proud papa Pat, such moments afield are the ones that keep luring himself, his wife and his kids to travel back to Saskatchewan each spring for another bear-hunting adventure. “You’re sitting there watching these bears, and all of a sudden, a smaller bear picks up his head and runs out of there, (so) you better get ready because generally, there is a bigger bear coming!” he said. Reeve notes that his group prefers the latter part of May during the black bear rut, a time that can be just as exciting as the fall rut can be for a whitetail hunter. Like whitetails, Reeve has found that bait or no bait, big bruins are very smart, react quickly to hunting pressure, and use their noses to sift through air molecules to detect even the slightest hint of danger. Big on both whitetail and bear hunting adventure, Saskatchewan is also a tremendous place to chase ducks and geese each fall season. While the trophies in waterfowl hunting aren’t measured or weighed, they can be found in the sheer volume of birds winging their way south as the transition from summer to winter occurs. I found that out several years ago hunting with Charlie Holder, owner of the Sure-Shot Game Calls company down on the Gulf Coast in Groves, Texas. After heading north from the Northway Outfitters lodge where we were staying, we were rewarded with non-stop early morning action as clouds and clouds of ducks and geese worked the vast decoy spread that our small hunting crew had put out before dawn. On this particular morning, as thousands of snow geese filled the air along with plenty of Canada geese and mallards, a small wad of specklebelly geese cupped their wings and headed towards our hidden position. When our pit boss named Wally cried out “Take ‘em!”, I settled my shotgun on a pair of snow geese working the edge while Holder knocked down a specklebelly double. Hustling out into the spread, we retrieved the downed birds, hastily retreated to the makeshift blind, and started calling at the next bunch working the decoys. A short while later, we took a closer look at Holder’s two specklebellies and discovered that these two birds were trophy specimens in their own right — two big geese that are now mounted together in the call maker’s office. Why were they trophies for a dedicated waterfowler? Because the pair of geese each wore silver leg bands put on years earlier by biologists who were hoping to track their autumn movements and eventual harvest by hunters. With a Texas-sized grin, Holder looked at me and the others and put the whole experience of hunting in Saskatchewan into proper perspective. Indeed. Because whether the goal is a trophy whitetail buck, a big springtime black bear or the autumn waterfowl hunting memory of a lifetime, when hunting in Saskatchewan there’s never been a truer statement made.